There were various ways to gather a collection of prints in the 20s. Here are three of them. Prints have come out of the portfolio into the frame, because that personal quality which is the special virtue of good etching, achieves a tie between the person and his surroundings in a peculiarly satisfying manner. And indeed many Brouet prints which appear on the market in America nowadays are still to be found in their original frames. Unfortunately, this is not without consequences on their state of preservation, mainly because of paper aging, most often because they were left exposed to natural light for decades... And in fact many of those framed prints were gifts to parents or friends, as remnant dedications attest. The illustration acompanying this post is a label of the Bresler company, found at the back of a frame holding a war print, Peeling Potatoes (BA 175.6), here enlivened with an unlikely title, maybe designed to improve the sales of an item which likely rapidly fell out of favor. Such was probably the type of Brouet collection owned by the average reader of California Southern. An american collection from the 20s of the type more likely to be owned by the reader of Fine Prints of the Year surfaced recently when it was sold at auction in 2013. It seems to reflect the organization of the american print market during these years of print boom. Most of the artists cherished by this collector were British - or Scottish - (Haden, Middleton Todd, Lee Hankey, Martin Hardie, Augustus John, James Dowd, Sidney Tushingham, Edmund Blampied, Christopher Nevinson, W. Douglas McLeod, Charles William Cain, Aileen Mary Elliott, Eileen Soper), and only a few were American (Pennell, Emil Fuchs, Joseph Uhl) or from non-british european nationality (Zorn, Bauer, Bejot and Brouet). Among the artists with the largest holdings in this collection we find Blampied, Lee-Hankey and Brouet. The Brouet selection comprised 35 prints, a significant holding, and remarkably homogeneous. All these prints had recently been published either by l'Estampe Moderne or by Lefevre and Bignou, including these two prints which appeared as illustrations in two articles from American Art News devoted to Brouet and his recent exhibitions: the Café (Ba 203) and the Net Menders in Cannes (Ba 364). In the collections, the impressions are all from the reguler edition, and the sheets have been perfectly preserved, as if stored in folders straight from the press. Some of them even bear a rather trivial stamp asserting that they were "Made in France". A slightly soulless collection it appears, and it is quite possible it was assembled for purely speculative purposes during the boom, as was not unfrequent at the time, and was simply put aside and forgotten when the market plummetted. In contrast, a collection of Brouet prints of unsurpassable sophistication, also assembled in the 20s', is Albert Wiggin's. It is no surprise that the famous american banker and print collector became interested in Brouet's work, especially given his parrallel interest in more satirical but also socially oriented French prints such as Daumier's and Gavarni's. 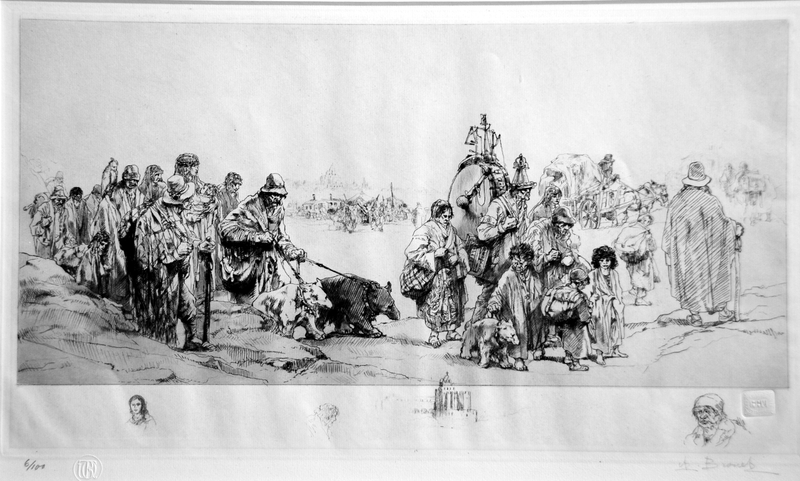 Aspire Auction, Sept. 2013, A Collection of Etchings Cached since 1920's. It is unsure when Grignard separated from his collection of Brouet prints. However his manuscript catalog file has not been updated after the early 20s, and a number of drawings were sold in 1929. The collection is now preserved in the print department of the Boston Public Library. It is quite possible that Heintzelman acted as middleman in the transaction. In any case, he organised the Brouet exhibition which took place in 1948 at the BPL.